Provides flexible positioning of the iPad or tablet for display or input use. Universal desk mount works with all tablets and tablet cases. Revolutionary puck with clean, removable gel adhesive mounts to any iPad or tablet and any tablet case. Grab-and-go interface that adheres tablet and puck to arm via magnet and allows for one-handed attach and release from the arm mount. Arm mount quickly attaches to desk edge. Option to bolt through desk (hardware not included). VESA mount option available for dual screen computing. Exceeds BIFMA standards for technology mounting devices. Comprised of 99% recyclable content. Introducing Tablik - a tablet mounting solution that changes the way you interface with your tablet at work and in the home office. Tablik suspends your tablet above the desk where it can be easily positioned for comfortable viewing or typing. 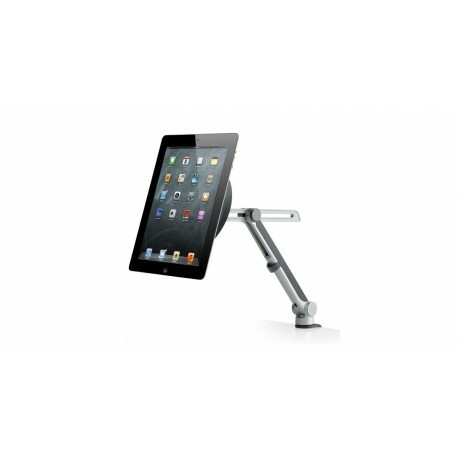 The Innovative Tablik arm mount provides flexible positioning of the iPad or Tablet for display or input use. The universal desk mount works with all tablets and tablet cases. Use the form below to inquire about this product.